The DOH-247-KIT is comprised of a compact splashproof dissolved oxygen meter and a polargraphic dissolved oxygen probe with automatic temperature compensation for field or laboratory applications. 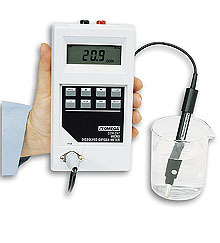 The unit measures dissolved oxygen in ppm and percent saturation, temperature in degrees Celsius and uncalibrated raw signals in µA. The µA signal allows one to monitor the condition of the probe membrane. This can help determine if the membrane has been clogged and needs to be replaced. The DOH-247 is microprocessor based allowing quick changes from mode to mode by simply pressing the keypad. In addition, the unit has a recorder output of ±200 mV corresponding to the mode of operation. The DOH-247 Kit is supplied with the dissolved oxygen probe, 2 replacement membranes, electrolyte fill solution, and a hard carrying case. Please download PDF specifications for complete list of available models. 참고: Kit Includes dissolved oxygen meter and probe, 2 replacement membranes, electrolyte fill solution, battery and complete operator’s manual.